You may have heard that urinary problems, such as the inability to pee, can occur when you take cold medications. Or, perhaps, you took a cold medication and are wondering why you aren't able to urinate. Prostate problems and medications for an enlarged prostate don't always mix with medications for the cold or flu. Let's talk about what you need to know—and what to avoid—so you don't face this uncomfortable situation. Or, if you're facing problems right now, skip to the second to the last heading at the bottom of this article to figure out your next step. What Cold and Flu Medications Can Cause Urinary Retention? Flu season and colds hit every winter, and even with a flu shot, many people still experience those days of a cough, runny nose, and congestion. Since the symptoms of the cold or flu can make it hard to work or play, a lot of people choose over-the-counter cold medications to fight the symptoms. Keep in mind that other than Tamiflu (oseltamivir phosphate), which is a prescription drug for people assumed to have influenza, the medications available help with symptoms alone. They do nothing to treat the actual virus. Common medicines like pseudoephedrine work by constricting the muscles in the nasal passages and sinuses to help the sufferer breathe better. The muscle fibers in the nose and sinuses are under the control of alpha adrenergic receptors. When a man takes a cold medicine, these same muscle fibers contract in the prostate and narrows the urinary channel. If a man has an enlarged prostate (which is the norm rather than the exception as men age), the urinary channel may be narrowed so that urine can't get past. The result is painful urinary retention. While most often urinary retention in response to cold and flu medications occurs in older men with benign prostatic hypertrophy, it has been reported in children as young as age 3. What Medications Can You Use for a Cold if You Have Prostate Problems? If you have an enlarged prostate or other prostate or urinary tract problems such as prostate cancer, what can you take to get relief from that stuffy, runny nose? Stay away from pseudoephedrine, ephedrine, and phenylephrine products. If you read carefully through the active ingredients in cold and flu medications you will find these compounds listed often. One study found that 6 percent of men aged 50 to 69 had experienced aggravation of an enlarged prostate due to taking cold medications. Not surprisingly, visits to the emergency room with urinary retention are more common during the winter months. Nasal sprays such as Afrin, (which work fairly well short term to open up nasal passages without getting absorbed into the body). Keep in mind that Afrin should only be used short-term, as it may cause a rebound effect (worsening of your symptoms) if it is used for more than a day or two. Putting eucalyptus and camphor products under your nose and on your chest. This doesn't work physically—it doesn't reduce congestion—but it may trick your brain into thinking you are breathing better. This is especially true for those who used these treatments as a child and have memories of being pampered and cared for in association. Hot baths are an easy option and are readily available. Steam humidifiers are cumbersome but can also provide symptomatic relief without interfering with the prostate. If you are taking a medication for an enlarged prostate, it's important to know which category of medication you are using, whether it is an alpha-blocker or a 5-alpha-reductase inhibitor. If you are taking an alpha-blocker, combining these drugs with cough or flu medications isn't a good idea. Since cold medications such as pseudoephedrine work on alpha adrenergic receptors, taking a cold medication which blocks the receptors negates any effect of your prostate drug. The cold medicine blocks the signal to the smooth muscle in the prostate to keep the channel open. In essence, you're waging a pharmaceutical war against yourself! As an example, alpha agonists like Sudafed (pseudoephedrine), work directly against alpha blockers like Flomax. Side effects of alpha-blockers not surprisingly include a stuffy and runny nose. Keep in mind that these drugs will not interfere directly with cold medicines (by canceling out their actions), but taking cold medications could still result in urinary retention. If you find that your prostate is sensitive to cold medicines, the news may not be all bad. In some ways, having urinary symptoms due to a cold medication can be the warning sign you need to seek medical attention. If you have experienced urinary symptoms (such as hesitancy or retention) on cold medications, it's probably a good time to see a urologist who can evaluate your prostate and potentially recommend treatment. After all, most men do not have problems taking cold medications and peeing. What Should You Do If You Can't Pee After Taking a Cold Medication? If you've taken a cold medication and can't pee, stop the cold medication immediately, and call your doctor. Sometimes the problem will resolve on its own, but this does not always occur. Your doctor may suggest that you go to the emergency room so that a catheter can be used to drain your bladder until the effects of the drug wear off. If you are experiencing extreme discomfort, go to the emergency room right away. If you've just had some minor problems with urinating after taking a cold or flu medication, make an appointment to see a urologist. Your symptoms may just be the warning sign you need to seek treatment for a prostate problem. Cold and flu medications can be a problem for people with prostate problems (even if they don't know they have them) in more than one way. The commonly prescribed alpha-blockers for prostate problems (and high blood pressure) can interact directly with cough and cold medications. Other medications may not interact directly, but the fact that you are taking a medication for your prostate places you at a higher risk of developing urinary retention in response to a cold and flu medication in the first place. 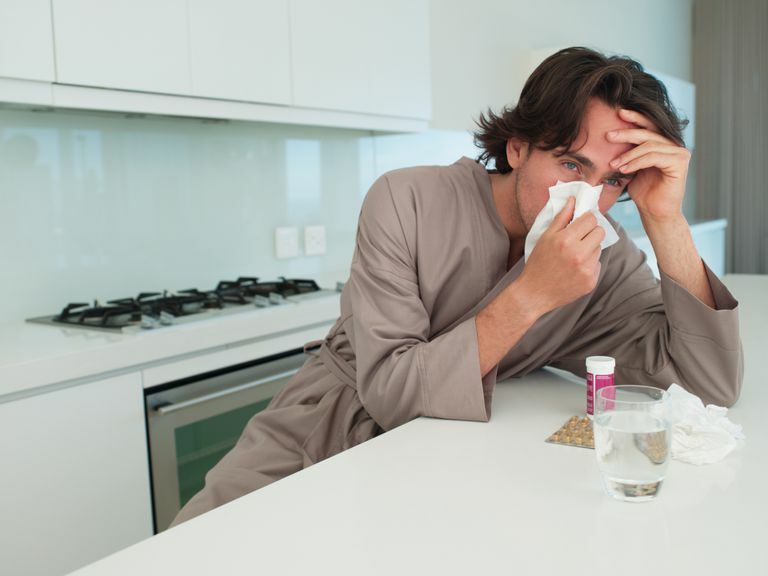 The cold and flu run rampant in the winter, though cold viruses occur year round. Understanding the problems that may occur when cold medications are combined with prostate medications illustrates the importance of considering drug interactions and potential side effects of any medication you use, whether prescription or over-the-counter. This is a good reminder as well that sometimes the old standby remedies of rest, fluids, and taking a hot shower are sometimes the safest option for managing your symptoms. Kasper, Dennis L.., Anthony S. Fauci, and Stephen L.. Hauser. Harrison's Principles of Internal Medicine. New York: McGraw Hill Education, 2015. Lee, K., Koo, K., Lee, S. et al. Effect of Climactic Parameters on Acute Urinary Retention Incidence. Lower Urinary Tract Symptoms. 2017 July 13. National Institute of Diabetes and Digestive and Kidney Diseases. Urinary Retention.